I’m always on the hunt for easy side dishes that can be doubled. If a kid can help make them, and the recipe is frugal, I’m all set. These potatoes and green beans fit the bill. The red potatoes were $.59 per pound at Costco for a 10 lb. bag. I found the organic frozen green beans at Amelia’s Grocery Outlet for about $2.00. I could have used our homegrown beans if I had any left in the freezer making this a cheaper side dish. Put the potatoes in a large sauce pan and cover them with water. Bring to a boil and let the potatoes simmer covered with a lid for about 10 minutes. Add in the frozen beans and cover again. 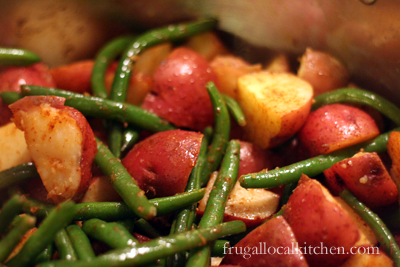 Cook for another 3 to 5 minutes until the potatoes and green beans are both tender, but not overcooked. Drain the potatoes and green beans. Drizzle olive oil over them, sprinkle the paprika, salt and pepper over top and gently toss to coat the potatoes and green beans. I am looking forward to trying this recipe, Barb, it looks delicious. Have a great week and thank you so much for sharing your awesome recipe with Full Plate Thursday. 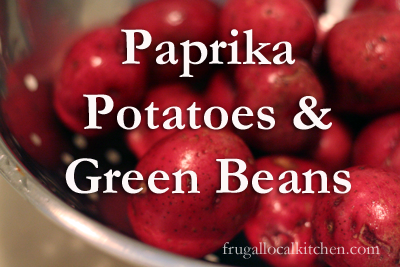 two of our favorite veggies… how smart to mix them! Thanks! Us, too. My kids will almost always eat potatoes and green beans. Yummy! I always like making potatoes in the oven with the spices and oil. Green beans sound like a good addition!